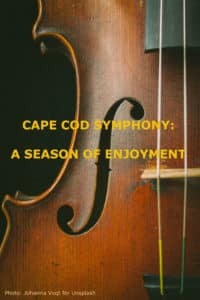 The end of the summer season is also the beginning of the Cape Cod Symphony season, and a highlight for all of us. The upcoming calendar promises a delightful variety featuring works from Mozart to Stravinsky, opera to love songs. The Cape Cod Symphony is a marvelous entity, featuring the world-class Director and Conductor Jung-Ho Pak and a bounty of extremely talented musicians. Performances are held at the Barnstable Performing Arts Center, a 1400-seat concert hall on Main Street in Hyannis, Massachusetts. Grab your calendars and book a date or two to enjoy these upcoming performances—with a stay at Whalewalk Inn, of course! The Symphony’s Masterpiece Series concerts feature free pre-concert talks with insights into the music of the evening. The 30-minute talks begin one hour prior to the concert. Series tickets: $135-$320. Individual tickets: $15-$71. Passport to America: The Immigrant Story. Included is the Grammy-nominated composer Peter Boyer’s Ellis Island: The Dream of America; plus works by Igor Stravinsky, Ernest Bloch, Franz Waxman, and Bright Sheng. Magnificent Mozart. Enjoy a performance of the requiem Eine Kleine Nachtmusic, “a little night music,” the composer’s final composition. Opera Without Words. The evening features orchestral music from three composers and their beloved operas: Warner, Rossini, and Waxman. Beethoven Unleased. The orchestra performs without a conductor, “set free” to interpret the music of the rock star of 1800’s. Legendary Love Stories. Passion and romance as interpreted by Tchaikovsky, Ravel, and Rachmaninoff. The Cape Cod Symphony also offers a CapePOPS Series, with upbeat music that spans genres and decades. Series prices, $86-$194; individual tickets, $16-$72. Symphony at the Disco: A Night at Studio 54. The sounds of the legendary New York City club come alive as the Boogie Wonder Band joins the symphony, performing hits by Donna Summer, ABBA, and others. Holiday on the Cape. At this annual event, the audience can join along in classic holiday songs, wonderful carols, and a special Celtic Christmas celebration. The Wizard of Oz in Concert. The symphony partners with the Cotuit Center for the Arts in a presentation of this beloved classic. Come for the music, stay for the enjoyment of a relaxing weekend at Whalewalk Inn! Give us a call or book your stay online. This entry was posted in Arts, Bed & Breakfast, Holiday activities, Hyannis, Music, Theater and tagged Cape Cod attractions, Musical events, things to do by admin. Bookmark the permalink.